Last weekend Ingrid and Lars from Cosy Travels and I visited visited the abandoned horror-themed restaurant 't Spookhuys, also known as House of 1000 Spirits. Rattling chandeliers, smoking ceilings and moving paintings once decotated this place. Transvestite draculas, illusionists and devil-worshiping dancers entertained the guests while they ate mud pie out of a skull. Rumor has it satanic rituals were held in this house in order to leave angry spirits to roam the premises. Finding 't Spookhuys was a challenge since our GPS indicated that the address was non-existent. Although we didn't see any ghosts or demons around the abandoned restaurant, the place had something unsettling. The restaurant closed its doors in 2008, but can still be visited at Steenweg op Gierle 441 in Turnhout, Belgium. I've never been to a horror-themed restaurant before, but I would love to. it looks incredible! Ziet er eng, maar toch wel tof eruit! Aww I was hoping it was closer to me, but I guess it doesn't really make a difference if it's closed :/ I bet it would've been fantastic dining there, all lit up by candle light.. Your life seems like a blast right now!! New Follower.... That restaurant looks like it was amazing! Would have loved to eat there! the abandoned restaurant looks terrific! it looks like you had a very interesting opportunity! I dislike anything horrific, so I've never been to a horror-themed restaurant and would never want to go to one. No way! That place is real? It looks so cool. Probably spookier now that it's abandoned. I've been to Jekyll & Hyde restaurant in NYC. Cheesy fun. Also The Slaughtered Lamb pub in NYC has good food. The freaky decorations make this horor-themed restaurant a great place to bring teens for some fun laughs. The abandoned horror-themed restaurant sounds cool. I've never been to a horror-themed restaurant. Pretty weird, but nice that you can still go see it. I am not big into horror, but I love history. I would go to a historical site like that. That place looks amazing! I wish we had something like that closer to where I live. It looks awesome! I have never been to one. Thanks for the chance to win! I think it looks cool. I would love to go there! I’m OBSESSED with your blog! I love the photos, stories, and reading about your life! So glad I found it! It looks to small to be a restaurant. And I've never been to a themed restaurant before. I would love to go to a horror themed restaurant! Never been to one, but sounds like fun! it looks seriously creepy! Not sure I'd want to eat there! I think this place looks awesome! I ate at Jekyll and Hyde's in NYC years ago and it was okay but nothing special. I love the reataurant, just not sure I could enjoy my meal with those faces staiting at me from the counter. It looks like a lot of fun! I've never been to a horror themed restaurant, but I'd certainly be game to try one! Never been to one, but it sounds great! But now all I can think of is Azumanga Dio and their haunted cafe planning. Wow! I'd definitely want to check something like that out--I'm curious as to how well the atmosphere would come through when crowded with people. I haven't been to a horror-themed restaurant but it's something I might visit one day. Spookhuy's looks like it's worthy of its name. I went on murder on the CT river mystery dinner... WAS AWESOME!!!!!!! This looks cool! And it is in my own country, I should definitely go there. Thanks for bringing it to my attention! I follow via GFC as Claudia. Wow! Looks so cool! I've never been to a restaurant like this before! Never been to a horror themed restaurant, but it looks like fun. Never been to a horror themed restaurant, but it looks fun. I would never go to a restaurant like that. I don't think I'd visit a restaurant like that. Never been to one but like the idea. Probably not...it seems gimmicky (never a good sign for the food), plus they'd probably make the food look disturbing. I've never been to a horror-themed restaurant before but that looks cool! My husband would enjoy this kind of restaurant, but not me! Honestly, my first thoughts was how pretty! I have never been to one but would sure love to! It looks really neat. The bar is creepy with the skulls on the front of it. I won't want to be there alone, late at night, even if the lights were on. I'm not really into haunted but that looks really cool! 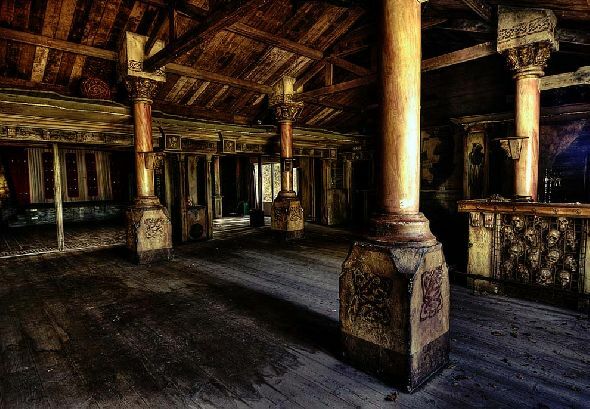 This place looks Super Creepy....I have never eaten in a haunted restaurant (that I know of), but it would be cool to try. I bet this one was Awesome to check out! I love the idea but i could go. My husband would love it. Wow, those pictures are really cool! Too bad the restaurant isn't open anymore - I would love to go. Neat looking place. Never been to one. I think its a cool idea! I have never been to a horror themed restaurant nor would I find it appealing to eat there. I wouldn't mind dreaming up dishes to put on the menu. I have never been to a horror themed restaurant, definitely would give one a try. I have never been to a restaurant like that. Looks interesting. Although I have never been to a horror themed restaurant, it seems rather spooky and fun! I have never been to a restaurant like that. Look interesting. never been to one before but it looks awesome! It looks small to be a restaurant. I haven't been to a spooky restaurant, but one that supposedly used to be haunted. Much bigger than the looks of this one. Looks fun, but I'd be so scared I wouldn't enjoy the food! This sounds too cool! I have never been to one. I would not go I can't handle horror movies let alone something like that. I've never been to a horror-themed restaurant. I don't care for that sort of thing. I love the gothic setting, and I think that this would be an amazing place to eat. Never been but it sounds fun. My boys would love it! I've never been but it sounds awesome! That looks so cool. I expect it would be too scary for my girls though. This theme is awesome. I would totally LOVE to visit! That looks really fun. :-) The building is wonderful for that type of restaurant. The place looks amazing and would be a lot of fun........but I have to wonder if I could actually enjoy my food? I don't know if I could eat my food. I can't think of a better way for me to celebrate Halloween. Everyone else can enjoy the theme and I can enjoy some food! I would never want to go to a restaurant like that. I don't like it as I dislike anything horror related. i would love to go to a place like this with my sister, who loves horror! i think I've heard of a similar place in Chicago? Im such a wimp so in order to go to a resturant like this I would have to have a couple drinks!! I have never been to a horror restaurant, but sure looks like a fun experience. Have never been to a horror themed restaurant but would sure love to try one. Thanks for the great giveaway! Looks a little creepy, but kinda cool too! I've never been to a haunted restaurant.....well not that i know of anyways! however, the town I live next to has all kinds of haunted stories! I might be to creeped out to eat my meal! I've never heard of a haunted restaurant - I think that's a neat idea and would be fun to visit around Halloween! Wow! So cool! I've never been to a restaurant like that but would love to give it a try. Sounds very entertaining! Never been to one before - and definitely wouldn't want to go after dark! This is such a cool idea! I wish there was a haunted restaurant around here! 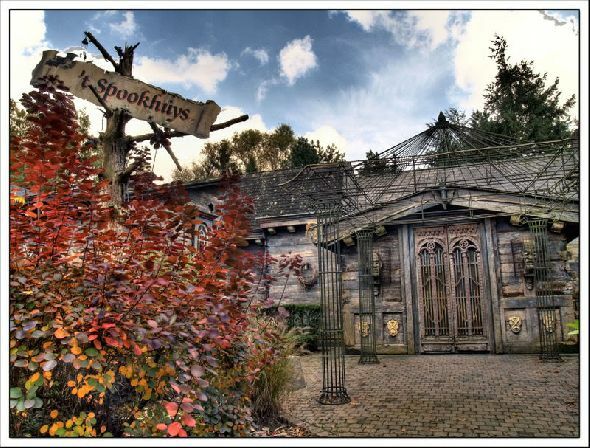 I've never been to a haunted theme restaurant, but the pictures look amazing and make me want to check it out! That doesn't sound particularly appealing to me.. I think I would have the hardest time eating at a horror themed restaurant. I wouldn't be able to relax enough to chew and swallow! It looks pretty excellent to me but I wonder how scary it would actually be. 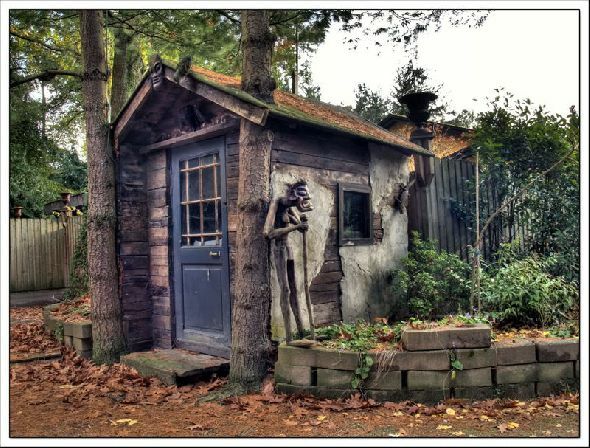 I have never been to a horror themed restaurant, but I think this one looks beautiful in its own way. Looks fun, I'd do it! I would definitely try it. I don't like horror flicks at all, but I think eating here would be FANTASTIC fun! It would be interesting to try. I think I might be too scared to eat! I've never been to a horror-themed restaurant but it sure sounds fun. Except honestly I don't know how much I'd be able to eat. I've never been. Seems interesting! Sounds like a great idea, no I have never been to one. I like the pillars and the wood/rustic look, but not a fan of the sculls. Wow. I've never been to a horror-themed restaurant. I think I would pass on that opportunity. Never been to a horror themed restaurant, and from the looks of the picture, I don't plan to! This restaurant is so creepy looking - just the thought of going in gives me chills! I've never been to a horror themed restaurant before, but it looks like loads of fun!!!! I've never been to a place like this. Looks too creepy for me. But thanks for sponsoring this great giveaway! I've never been to one, but it looks fun! I'd love to go a restaurant like that! Sounds like a neat idea. I would try it out as a dinner adventure. I think I would lose my appetite! I don't think I would every want to go to this restaurant! I've never been to one (I've never even heard of them), but this looks like fun! I've never been to one but I think it would be fun during the Halloween season! Never been to one.Looks interesting. It sounds like something perfect for fall/halloween. Never been to one before. The place looks really good. Looks like lots of fun. I think it looks great. I would love to go to it. It looks AMAZING. Just don't think I could eat there tho! I think it would be fun to eat there. I've never been to on. Visiting a horror themed restaurant would be an amazing and chilling experience, I've never been to one but my friend has and she described it as loads of fun. I might be too freaked out to even eat. This looks amazing!!!! Would love to come! I've never been to a place like this but I think the architecture of the home looks really cool. I have never been to a horror themed restaurant before, might be scary for the kids. I've never been to a horror themed restaurant, but I'd go if I got the chance. I've never been to one, but I have friends who'd love it! I've never been, but I'd go at least once! It looks freaky,and no I have never been to one.